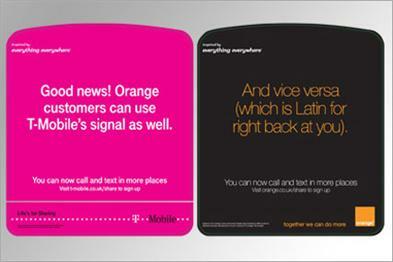 Integrated Marketing – Did Orange and T-Mobile Get It Right? Whilst on the tube last week, I spotted a very interesting poster ad for the collaboration between Orange and T- Mobile. Consecutive train panels cleverly told the story that Orange and T-Mobile customers can now use both networks’ signals, thereby enhancing the service received, delivered under the umbrella proposition of ‘Everything Everywhere’. What a clever idea I thought. And the ads were both excellently executed and planned, from a creative and media perspective. However, if I had missed these posters, I would know nothing about this great new service. And yet, I am an Orange customer, and have been for over five years. I have yet to receive any kind of personalised mailing, email or text message, despite Orange having access to all these contact details. This product innovation is not even highlighted on T-Mobile’s website. If you live outside of London, or don’t take much notice of poster advertising, this message could quite easily pass you by. Surely the first rule of Integrated Marketing Communications is that the customer comes first? Customer satisfaction rules dictate that leaving a customer out of the conversation is likely to alienate them completely. And when the conversation does take place, it is all too easy to fall into the trap of talking in marketing speak, and seeing the world from the individual organisational viewpoint, rather than the way in which the consumer may see it. Getting the communications strategy right is great, but even if you have a message that you can successfully translate across different channels, it will fall on deaf ears if it is in the wrong language, or fails to recognise consumer-centric needs because of inward-facing priorities. Secondly, too many silo’s can often preclude truly integrated activities. Whether the silo’s are organisational, or in the collection and interpretation of data, the separation of both duties and knowledge will often prohibit the consumer seeing one message from one brand. Finally, accountability is a huge hurdle to overcome when assessing the performance of integrated marketing communications. Putting individual ego’s aside, the battle for accurate assessment of each part of the puzzle can only be solved by investment in systems that determine the contribution of the individual components, as well as the overall effect. It has been proven time and again, that marketing works best when integrated through all customer touchpoints. Barak Obama’s presidential campaign is one of the best examples that springs to mind. His performance to date as leader of the Western World may not have set every critic on fire, but the manner in which his campaign had the consistency and presence across all channels was most definitely ground breaking. Although genuine integrated marketing campaigns can be off-putting, given the time, physical cost and collaboration involved, the rewards that can be reaped, will differentiate truly forward thinking brands. Thank you for your comment, and you are absolutely right in terms of the link, which has now been rectified. My criticism was as an Orange customer, who are my network service provider. I have no experience of T Mobile as a consumer, but as a long term customer of Orange, I was disappointed to have received no communication on the merger, or the improved services. Too often, companies send communication which contains low perceived value, but this is genuinely valuable news, and I was surprised not to have been informed by direct communication. Interestingly, on T-Mobile Business One I got phoned up to tell me about this. Thanks for your feedback Yasmin. I think your point is absolutely right and I too have noticed the absence of the T Mobile signal. I did join up for the joint signal opportunity, but nothing has happened yet. It is another great example of brands having lots to say, but not delivering on it. Great post Yasmin, thank you. I am an orange customer and received numerous texts about the merger. Surely the signal would only change to T-Mobile when it was necessary and possible to use it?